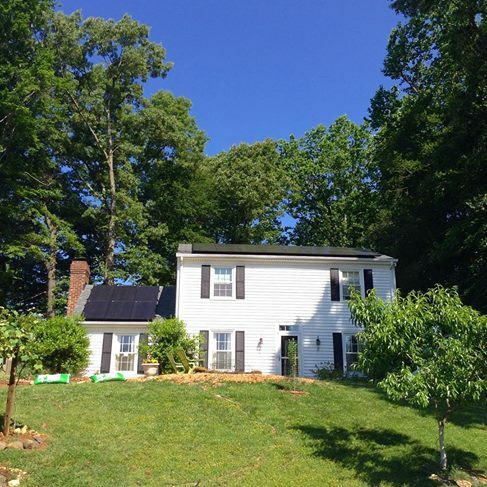 Last year, Sun Day Solar workers were busy putting panels on the split roof of Margaret and Dale Walker’s Charlottesville property. The result is an attractive installation that’s saving the Walkers a lot of money on their electrical bills – but it took some collaborative work to get this project up and running. Before installing the panels, there was significant work to be done. Five trees had to be cut down, and the Walkers decided to go ahead with a needed roof replacement before adding solar panels. After that, there were design choices and layout decisions. Doing a solar project is more than just setting panels on a roof and hooking them up. Experts and specialists have to know how to support a specific property in the best way – in this project, there was the need to find enough sunny space, as well as keeping walkways safe and attaching accessories such as a snow retention system. The beautiful solar installation that graces the Walkers’ roof was based on some deliberate process. “We had been looking at it for a while,” Dale Walker said earlier this month, talking about the Walkers’ motivations for pursuing the solar project. — He also said on a trip to Germany, a place of ancestry for his wife, he found himself thinking that the United States should have more competitive infrastructure, and wondering why the American economy lags behind in terms of a technology that’s so evidently useful. When the project got started, Walker said, it only took the crew about a week, despite some bad weather days, as well as stiflingly hot temperatures. The Walkers are also loving the look of the finished project, enjoying stylish U.S.-made panels in black, with painted metallic conduit running parallel to the gutters of the house. Walker talked about how matching the panels to the roof and getting made-in-the-USA panels helped add quality to the finished result. “He gave us a really good deal,” Walker said, explaining that while they were going to be getting Canadian-made panels, Sun Day Solar found the U.S. panels would look nicer against the dark shingle roof. The Walkers are also seeing a great number on most of their electric bills from Dominion: zero. Pointing out that many Southern homes are poorly insulated, Walker said net metering with solar really make sense for a lot of households in his area. As a result of getting solar installed, the Walkers have not had to pay a cent to Dominion over several months, although they did recently get a bill during the cold streak this past winter. Dominion has entered a net metering agreement with the Walkers, which means they are allowed to store excess electrical production on the grid and use it later when the sun is not shining. Walker estimates they often get several hundred kilowatt hours per month in excess power generated. In this way a customer gets to use 100% of the power they produce with solar. The Walker project is just one of many success stories from SunDaySolar. By taking the time to really focus on each customer’s property, we offer the means to make solar dreams into reality in a practical, comfortable way that will enhance the value of your home. When you want to partner with a winning solar firm, call Sun Day Solar and ask about financial incentives, easy installation, and more.